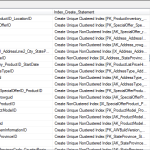 Home » Performance Tuning » How to create Drop and Recreate Script of all Indexes in a database? I found this interesting script once so thought of sharing with everyone. Special thanks to the Unknown-Creator of this script.